With the obvious exception of Woburn Abbey, few of Bedfordshire’s grand country houses have made it to the 21st century in anything like their original form. 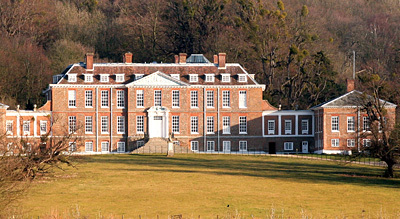 One that has, against all odds, is Grade II*-listed Ampthill Park House, near Ampthill, which, despite major alterations by Sir William Chambers in 1769, is still basically the house built by Cambridge architect Robert Grumbold in 1687-9 and completed by John Lumley of Northampton in 1704-6. In 1979, the crumbling mansion was rescued from dereliction and divided into four substantial houses. Two of these, the 11,647sq ft Hollands and its adjoining 4,369sq ft Chambers Wing, both beautifully restored in recent years, are for sale-The Hollands at a guide price of £1.75 million through Knight Frank (01442 861610), and The Chambers Wing at £850,000 through Jackson-Stops & Staff (01525 290641). As described in Country Life (October 21, 1971), Ampthill Park House is ‘magnificently positioned on the northern scarp of the ridge of undulating hills which straggle across Bedfordshire from Woburn in the west to Potton in the east, dividing the county into north and south’. Screened by a knot of trees from Ampthill town, even today, the Park House sits discreetly at the end of a long drive without gate lodges or electronic barriers, apparent only to people who know it’s there. Built on the site of a former royal hunting lodge leased by the dowager Countess of Ailesbury from the Ashburnham family, Ampthill Park House was the only important country house built by Robert Grumbold, best known for his work at Trinity and Clare Colleges in Cambridge. Park House was almost finished when the Countess died in April 1689, which led to work being suspended and Grumbold being paid off. A year later, wealthy landowner Lord Ashburnham consolidated his Bedfordshire estates by buying back the remaining lease from Lady Ailesbury’s heirs. In May 1704, he commissioned John Lumley to create the north front with its signature grand Baroque front steps-as typical of Lumley’s work as the more restrained south entrance is of Grumbold’s. In 1769, the young Earl of Upper Ossory brought in the architect Sir William Chambers, designer of Somerset House, to extend and modernise the house, adding east and west wings, the Georgian façade and the grand formal rooms. The saloon’s splendid neo-Classical ceiling was a joint effort between Chambers and master-plasterer Joseph Rose, Chambers’ design for which is now held at the Metro-politan Museum of New York. The new west wing provided kitchens and service quarters, and its matching east wing became a ballroom. Meanwhile, Capability Brown was brought in to address the park. The existing formal gardens were swept away, but Brown retained the best of the former landscaping, such as the oak copses and the lime tree drive designed by Chambers. Subsequent owners of Ampthill Park included Lord Wensleydale, Lord Ampthill and his daughters, the ‘Miss Russells’. In 1818, it became the home of Lady Holland, whose gatherings at Holland House, Kensington, were the most brilliant of her day. The 20th century was less kind to such grand aristocratic estates. The park at Ampthill was eventually passed to the town, and the house was requisitioned during the Second World War. After the war, the mansion became one of the first Cheshire Homes, and the place where Leonard Cheshire met his future wife, Sue Ryder. In the 1970s, the home was moved to new premises in the town, and a few years later, a neglected Ampthill Park House finally reverted to private residential use. Since then, the restoration of its wonderful interior has been a ‘work in progress’ for a succession of enthusiastic owners. For David Flowerday and his wife, Susan, who bought The Hollands in 1994, a house such as this ‘is not so much something you have, as something you do’. With its 20 rooms spread over three floors and a vast basement, The Hollands comprises the main part of the original Ampthill Park House, including the majority of the grand Georgian rooms and Lumley’s entrance staircase. The previous owners had already spent a decade restoring the two main floors, so the Flowerdays concentrated their efforts on repairing the leaking roof, converting and renovating the upper floor and the former servants’ quarters in the basement, and adding extra bathrooms throughout the bedroom floors. Fortunately, every bedroom was separated from its neighbour by a large closet, which was easily converted to a bathroom, thereby avoiding conflict with English Heritage, who hovered in the background to ensure that the building’s Grade II* listing was always respected. The Hollands’ many fine rooms include the impressive entrance hall, Chambers’ peerless saloon or drawing room, with its magnificent marble fireplace, the panelled dining room, the library and the garden room, with views over the 1¼-acre private garden, farmland and park beyond. Another striking feature is the inner staircase hall with the galleried landings of the first and second floor directly above it, topped by a glass cupola that floods the stairwell with natural light. In all, the house has six reception rooms, a kitchen/breakfast room, a basement banqueting hall, a two-bedroom master suite, 7/8 further bedrooms, four further bath/shower rooms, a staff flat, a cinema, a gym and a studio. Furnishing the house has been an adventure on its own, and most of the pieces collected by the owners over the years-many of them ‘elderly, well-used and well-loved’-are quite unsuitable for the Flowerdays’ new home in Dartmouth, so will be offered by separate negotiation, or sold on-site later. One piece of art a future owner would surely want to acquire is a painting from 1760 by Benjamin Killing-beck of the Earl of Upper Ossory and his family, and Ampthill Park House in the background. ‘Some people may find the notion of sharing a country house off-putting, but everything is on such a scale here that you hardly see your neighbours, except at our annual dinner,’ says Mr Flower-day-a view that their neighbours in the smaller, but no less private, Chambers Wing will surely support. Having moved there some 10 years ago, when their children were small, the interminable secondary-school run has persuaded the current owners to move to Bedford itself. Being the former service area, the ground-floor rooms of The Chambers Wing are generally plainer than the ‘family’ rooms of the main house, but are still elegant and well-proportioned. It has three reception rooms, master and guest suites, four further bedrooms, a family bathroom, and an acre of private gardens and grounds with ‘glorious’ views of the surrounding countryside.